Christ is beardless and youthful in the Early Christian style. His pose recalls that of an enthroned Roman emperor. He is holding a scroll with the seven seals as described in the book of Revelation. He sits on an orb that represents the world. Below him are the Four Rivers of Paradise. 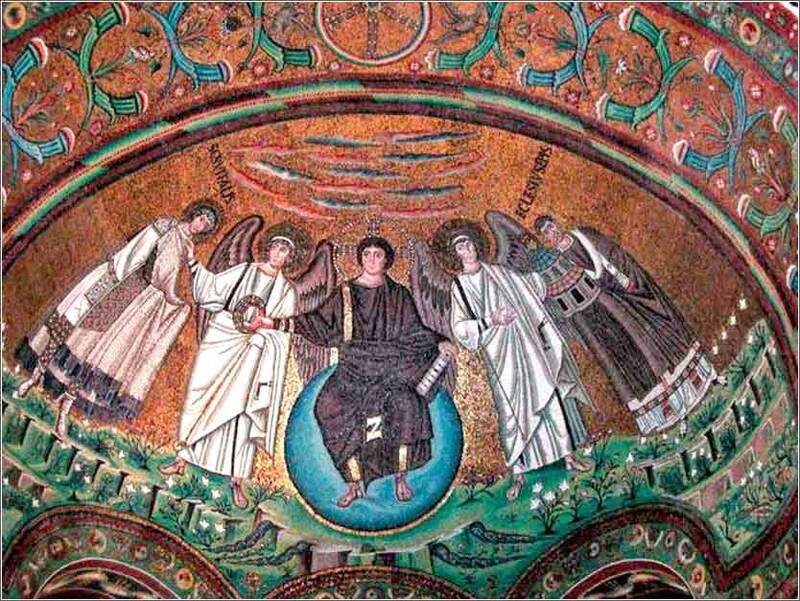 On his right, Christ extends a victory wreath (Roman symbol) to Saint Vitalis, who is accompanied by an angel. On his left stands another angel who is introducing Bishop Ecclesius. Ecclesius is presenting a model of the Church to Christ. The foundations of the church were built under the authority of Bishop Ecclesius. Notice that both Saint Vitalis and Bishop Ecclesius are labeled above their heads. and he will be famous for all time to come. The Lord will bring justice and show mercy to all who serve him. Idols of silver and gold are made and worshiped in other nations. They are completely deaf, and they can't breathe. will end up as helpless as their idols. Our struggles to free ourselves from pain are ultimately futile. Through our will and our nature, we make ourselves slaves to the corruption of the world. We are slaves to what we see. But what we hope for, and with the certainty of faith know that we will receive, cannot be seen. That is the very nature of faith and hope. Therefore, we wait for redemption eagerly. Just so, we wait for Christ to come again. Sometimes we wait in terrible pain, but no matter how anxious we become, we cannot force time to move faster. Christ will come when it is God's will for Him to come; we cannot make it happen any faster. We are like children on Christmas Eve, but now we have learned that we must simply wait, relying for comfort on our knowledge that the day will come. Annunciation to the Virgin by Antonello da Messina, ca. 1474. 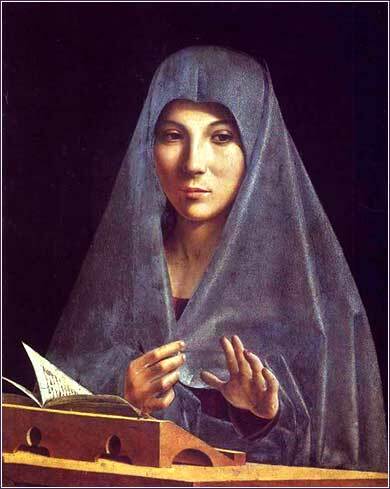 This haunting treatment of Mary, interrupted in her reading by the angel, shows her with a sober, serious intelligence and emphasizes depth of character, rather than the unselfconscious girlishness generally associated with her. Yet she retains her innocence, as shown by the blue veil.